Customers who chat are even 10 times more likely to make a purchase. More chats equals higher satisfaction, improved customer engagement and ultimately more sales. How to implement LiveChat effectively to unlock its full potential? Start by customizing your chat graphic to make it stand out. Your visitors need to see it clearly the moment they reach your site. A colorful, well sized button will grasp your visitors’ attention right away and is likely to net you a chat. To increase the chance of chatting with customers, go one step further and actively engage them using automatic greetings. Even if they don’t accept the greeting, just letting them know you’re there builds trust and confidence in your company. When you feel the chat button is not enough, you have another useful tool at hand. The Eye-catcher, as the name suggests, is a way of ensuring your visitors will notice your chat. With the Eye-catcher enabled, all your visitors know that your chat is just one click away. To activate it, go to the Eye-catcher section and check the Enable eye-catcher box. Finalize by clicking Save changes. You can choose from the available gallery of Eye-catchers or upload a unique Eye-catcher, which you designed yourself. 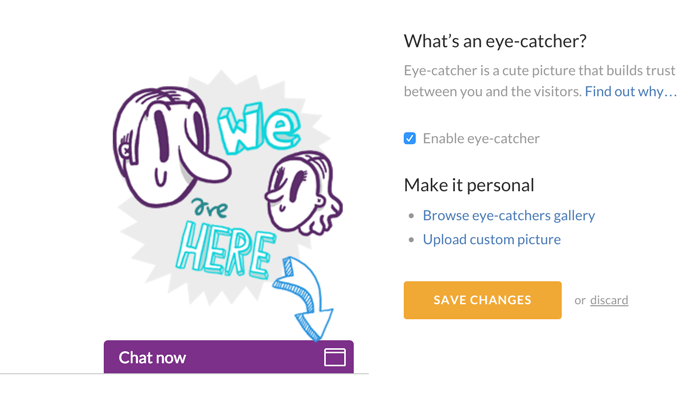 To enable your custom Eye-catcher, simply go to the Eye-catcher section and select Upload custom picture. 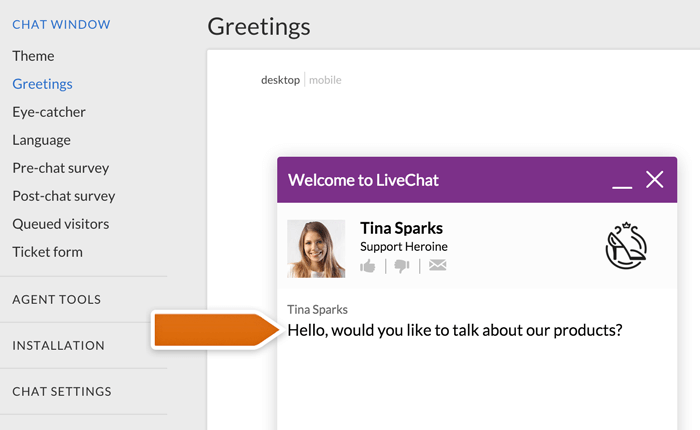 You should add LiveChat to all your product pages to ensure your clients can reach you whenever they need help. Chat on all pages is like a helpful shop assistant that will go out of his way to help you in your purchase decisions. Recreate that feeling and answer questions on all pages of your website. Keep in mind that your website is not the only place where customers can reach you. Consider adding the direct chat link to your e-mail signature, social media posts and newsletter campaigns. 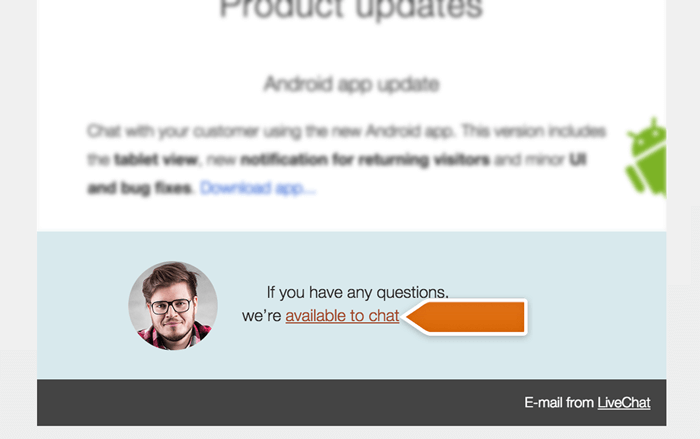 It’s a nice feature that allows your customers to access your chat instantly if they have any questions or doubts. Remember that well-informed customers make for more confident buyers. Did you know that you can place your LiveChat on Facebook to chat with all your fan page followers?